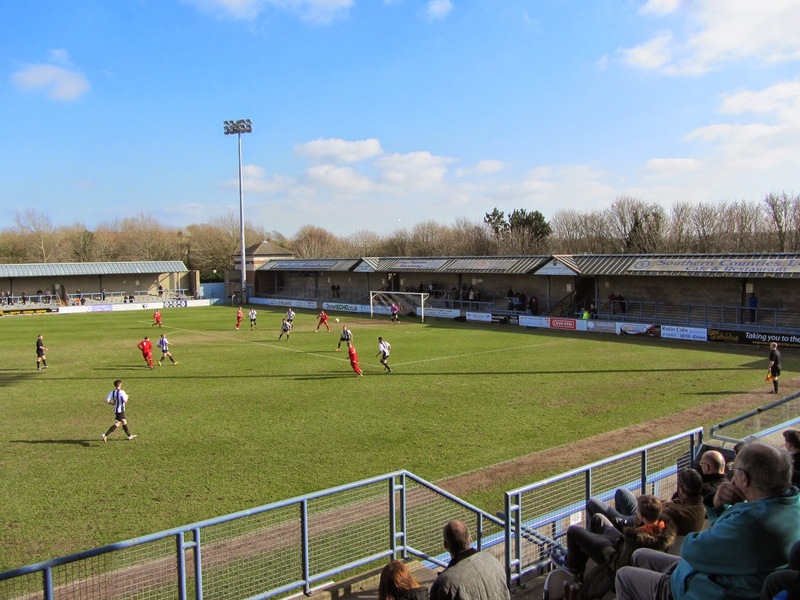 My third ground of 2015 was on Saturday 21st March at the Avenue Stadium in Dorset, Dorchester. 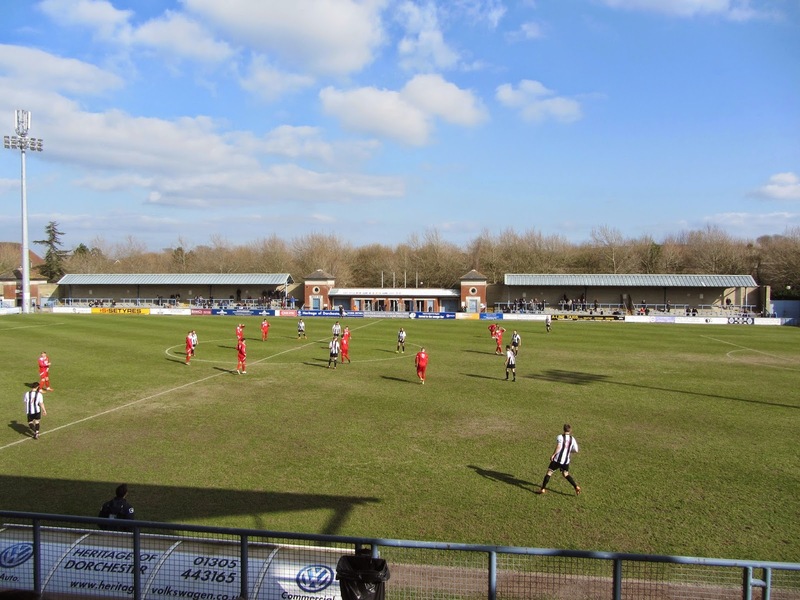 The match was Dorchester Town vs. Frome Town in the Southern League Premier Division. 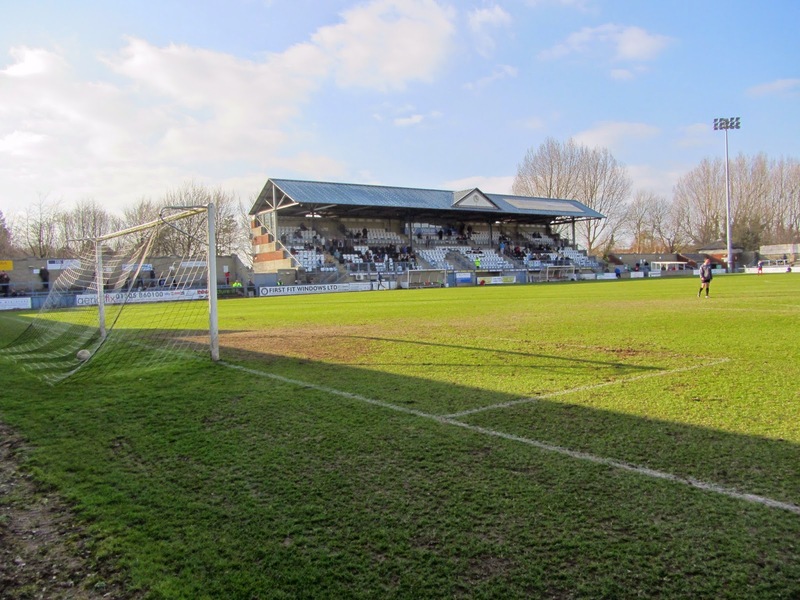 The Avenue Stadium was built on the southern tip of Dorchester next door to a retail park. The venue is bordered by a Tesco store to the north, the A35 to the south and a railway line to the east. This line splits off to Dorchester South and Dorchester West railway stations, both approximately 1 mile from the ground. The venue has been home to the club since 1990 when it replaced their nearby former home, also called 'The Avenue', where they had resided for the previous 61 years. The ground is dominated by the main stand which is raised above pitch level on the western side of the venue. This 710 seat structure is split into 10 small seating blocks across two levels with the interior of the stand including the club reception and ticket office. Either side of the stand there small sections of uncovered concrete terracing. On the opposite side of the pitch there are two sections of covered terracing split in the middle by additional turnstiles and a small club shop. Similar covered terracing takes up the entirety of the southern side of the ground and there is also a food outlet in the south-west corner. The northern side of the ground has the same level of concrete terracing but there is no roof in this area. Both sides went into the game in the bottom third of the table and it was not difficult to see why after a desperately poor first half. Frome edged the early passage of play but the best chance of the half fell to the home side when Ben Watson's close range shot was tipped onto the crossbar by visiting keeper Darren Chitty. The second half was a little better but the game didn't spring into life until there was a quarter of the game left to play. In the 74th minute the hosts grabbed the lead as Bradley Tarbuck showed good strength to loop a seemingly lost ball back into the danger zone and Ben Watson was able to nod over the keeper into the top corner. Frome came back at Dorchester and in the 85th minute levelled the game up at 1-1. Shortly after having a shot cleared off the line the visitors kept sending it back into the area and with the hosts unable to gain control the ball fell to Mark Cooper on the left. Cooper whipped the ball into the six-yard box for Lewis Haldene whose saw his first effort parried by Alan Walker-Harris but then reacted quickest to the rebound to send the ball over the line. The final few minutes saw end-to-end football but with no clear cut chances Frome were able to rescue a point.